Rubb provides quality, cost-effective, long-term investment that can be compromised to suit changing needs. The UK Ministry of Defence (MoD) has been using Rubb military buildings for more than 35 years and has recently seen the benefits of the company’s EFASS post-use storage, assessment and refurbishment service. In 2010, work began on the construction of six Rubb military warehouses for Operation Herrick in Afghanistan. The Expeditionary Forces Aircraft Shelter System structures measured 100m in length and featured span widths of 25m. 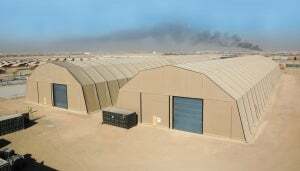 The buildings were supplied to the Operational Accommodation Technical (OAT) Output Section of the Expeditionary Campaign Infrastructure (ECI) Project Team, who successfully delivered the equipment infrastructure for the Interim Force Primary Depot (IFPD) in Helmand Province. These structures, among others, have been returning to Rubb throughout 2015 / 2016, with the first one arriving back at the Gateshead plant being converted into two new aircraft hangars. Rubb sales manager Andy Knox said: "There are numerous EFASS shelters deployed around the world. Many will be returned to the UK to undergo refurbishment work to bring them back up to A1 (new) condition. A typical refurbishment to bring the building back to ‘good as new’ will cost between 5% to 10% of the cost of a new hangar. "When the first 25m x 100m building returned, we inspected it, cleaned it and made any necessary repairs so it is fully refurbished. "We then added the components needed to produce two shorter hangars measuring 25m x 40m, each featuring one Heli-Door in the front gable end and one Roller Shutter Door in the rear gable end." The modular nature of the EFASS means that the aluminium framing system, steel components and PVC covers can be reused to create a variety of configurations to suit changing requirements. Rubb managing director Ian Hindmoor said: "We are always looking for ways to add value to the products and services we provide. "This process is an excellent example of adding value to the ways that we can help our client base. "Our customer care goes beyond just one sale and into aftercare commitment, maintenance, delivery of improved solutions to existing and changing requirements and a dependable system of ongoing R&D and engineering in the fabric building industry. "We take care of your building investment for you, prolonging the life of your EFASS and providing savings on long term costs." Rubb will be presenting the Rubb military structure range, along with some exciting new projects at MRO Europe, Stand 11-154, The RAI Amsterdam, 18-20 October.